The 30 short stories and poems in this collection vary widely in theme and tone, from the dark, recursive ""Other People"" to the witty, R.A. Laffertyesque ""Sunbird."" Aside from one new tale, ""How to Talk to Girls at Parties,"" all material has been previously published. Gaiman performs admirably as narrator for the most part, changing his style from story to story to better suit the tone of each. However, in the more experimental pieces in the collection, this practice backfires and may leave listeners reaching for the fast-forward button. The poems often work on paper, but when read aloud many feel like disjointed, nonsensical stories. Gaiman is at his best when narrating his more traditional tales, such as the sly and inventive Sherlock Holmes/H.P. Lovecraft pastiche ""A Study in Emerald,"" and the noirish ""Keepsakes and Treasures."" 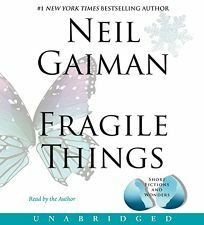 There are enough terrific stories in the book to make it a must-have for Gaiman fans, but dedicated readers may want to choose the hardcopy edition instead, so as to more easily skip the dross. Simultaneous release with the William Morrow hardcover (Reviews, July 17).